Torquay United have signed striker Iyseden Christie on a contract until the end of the season, following his release by Stevenage. The 32-year-old, who had been on loan at Kettering this season, could be at the centre of a legal battle between Borough and the Poppies. Borough say Town signed a deal to sign Christie for a five-figure fee, before reducing their wage offer to him. Stevenage are now considering legal action against Kettering. Christie joined Stevenage in June 2008, but has been on loan at Kettering Town since September, making 19 appearances and scoring six goals. 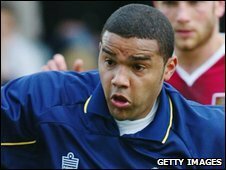 Torquay will be Christie's 10th club having begun his career as a trainee at Coventry City in 1995. He has played in over 400 matches and scored 112 goals.